Easy to learn and use, it's an intuitive system that lets new operators get up and running fast. Operator access to functions can be restricted by skill level, allowing minimally trained staff to be productive in minutes. GIBS is the Group Insurance Billing System for retirees, leave of absence, medical leave or any other continuing coverage that will be direct billed to the participant. GIBS is uniquely designed to let you handle any type of direct bill coverage. It includes very extensive functionality to handle rates that are based on one or more variables, such as length of service, age at retirement, age of both the employee and spouse or any other criteria. Flexible design lets you easily modify the system to meet any special requirements of any type of non-COBRA direct bill coverage. The system is driven by Category Codes that let you define all parameters and letters separately for each category of direct bill coverage. There are no limits to the number of carriers, plans, rates or people. The system automates all functions from enrollment to eligibility output. You can even create your own date, character, numeric or logical user defined fields to hold and use unique data. 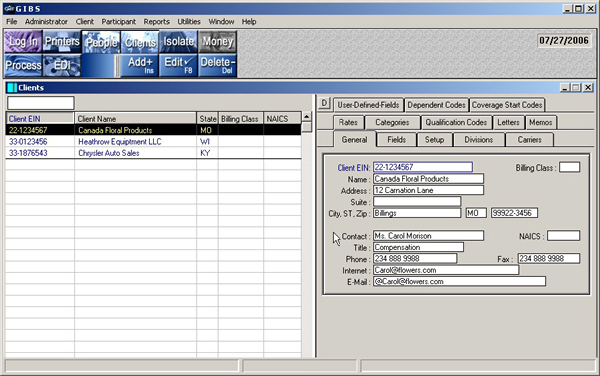 All system correspondence can be customized for each type of direct bill coverage. Use Coupon, Monthly, All-At-Once or No billing methods - bill for any time period - from days to months, quarters to annual. Reliability that you can count on to accurately maintain and process all of your data according to the parameters that you set. Full premium accounting functions automatically handle partial, advance, NSF, pro-rated payments. Integrates seamlessly with all other EAS Suite products. Add EASWeb to completely internet enable the system. See the EASWeb product description for details.